It’s not always sweater weather. Keeping your cold-weather clothes front and center in your closet doesn’t make a lot of sense when you’re sporting tank tops. But how do you store your sweaters without ruining them? For that matter, should you ever be hanging your sweaters? If you want to hang your sweaters, it’s important to do it in a way that fights gravity. Putting your chunky sweater on a hanger the regular way will leave the shoulders with unflattering indents and the bottom droopy. You’ll be disappointed the next time you try to wear your favorite sweater after a few months in the back of your closet. Instead of hanging your sweater in the traditional way, begin by folding your sweater in half vertically. Next, put the hanger hook in the armpit of the folded sweater. Fold the sleeves over one side of the hook and the body of the sweater over the other side, crisscrossing them. Now your sweater is ready to hang and fine fabrics like cashmere won’t get damaged. Want to use your closet shelving to store your sweaters during the on- and off-season? Cotton bins are a great option for storing delicate and soft fabric sweaters. These bins are more breathable than a sealed plastic bin, and they can often expand a bit as needed to accommodate a chunkier sweater. Wood bins may also be a good option for storing folded sweaters (as long as your clothes won’t get snagged on the occasional splinter). 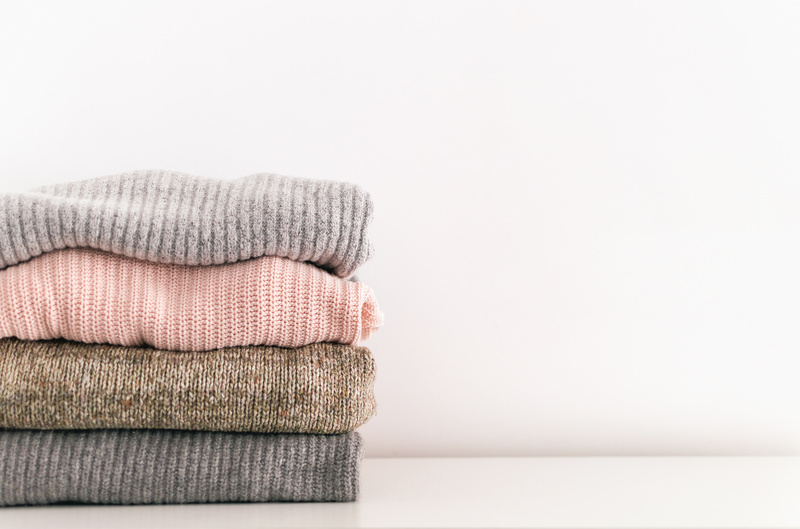 Keeping sweaters in an open-top cotton or wooden bin also makes them more accessible all year round (as opposed to storing them under the bed in a plastic container). If your sweaters are going away for an extended period of time, rolling them up may be a better solution. To successfully roll your sweater, lay it flat and run your hand over the top to smooth out wrinkles. Fold one arm horizontally across the top, so that the wrist cuff reaches the opposite shoulder area. Then repeat the process with the other arm. Now you’re ready to roll – literally. Begin at the bottom hem of the sweater and roll upward. Once you have the sweater in a neat cylinder shape, gently tie a cloth tie around it to keep it in place. Your sweaters are ready to be stacked on your closet shelving or in a cotton bin until it gets chilly again. If you still need help strategizing your sweater storage, Closet World is here to help. We’re armed with an infinite number of custom closet possibilities and we can design a custom space that makes your life easier. Keeping your sweaters and entire wardrobe in order has never been easier or more stylish than when you’re working with Closet World.